This new to-be-built custom riverfront estate by Compass Custom Homes will wow you from start to finish. Quality craftsmanship in this 6000 sq ft sprawling 5 bedroom 5 1/2 bath home. 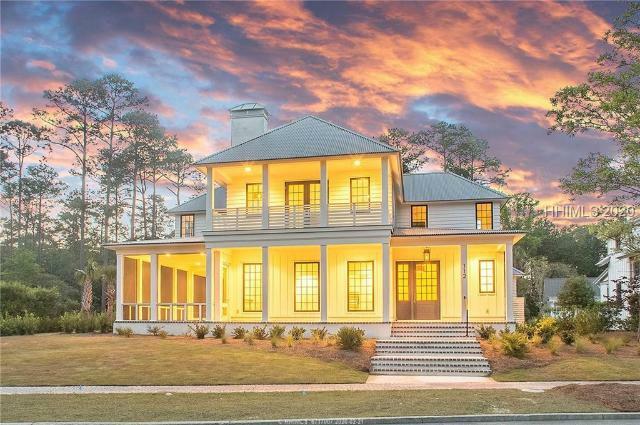 A beautiful mixture of white washed bricks, hardiplank siding, mahogany doors, metal & slate roofing that has expansive panoramic views of the May River. This May River Forest location is very private, directly on the water with an extra wide lot overlooking Crane Island. Spectacular! Designed by Pearce Scott & built by Shoreline 12 Devonshire is luxurious living set on one of the most private homesites intensifying the Palmetto Bluff lifestyle. Gorgeous water & wooded views enhance the flowing floor plan for any lifestyle. This design has comfort throughout with soaring ceilings, walls of glass along with great privacy. Great room has banquet sized dining area, cooks kitchen, butlers pantry, two spacious master suites on first floor offering great flexibility for the corporate retreat lifestyle! Second floor suite with office & sitting area plus suite over garage! A total of 6,200 sq. ft under roof w/ great outdoor space. More than two acres of prime real estate are now available in the highly popular Point neighborhood of Palmetto Bluff. With picturesque views of the marsh and 10th green of the May River course, this property affords a rare opportunity to build your Lowcountry dream home on a premier and expansive riverfront site. 63 Myrtle View Street includes a private community dock and is only minutes by bike or golf cart ride from all the amenities of Wilson Village; Canoe Club pool, fitness center, tennis, golf course, R.TGÇÖs Market, Montage Palmetto Bluff, and more. Fabulous homes and beautiful Lowcountry scenery welcome you to May River Forest, the most established country neighborhood in Palmetto Bluff. 85 Trout Hole Rd is a spectacular 4-acre property on a prime piece of land with mature hardwoods. Located at the end of a cul-de-sac, this site allows you to stroll along the May River for almost ? mile without ever leaving your own piece of paradise. Gorgeous long-range views of the 15th hole of the Jack Nicklaus Signature Course also edge the property. A wonderful locale to build your private compound, yet just 1.5 miles from Wilson Village. Protected on three sides by forest and water, no other sites in view, 237 Mt Pelia offers the peace and privacy of country living in Palmetto Bluff. This 4 br, 4 ba, 2 half bath Pearce Scott design was featured in Savannah Homes Magazine, reclaimed hardwood floors, brick floors in the dining area, California closets, Wolf/Sub-Zero, a large farm sink in the kitchen. Open entertaining spaces with seamless transitions between indoors and outdoors, upgraded A/C systems, large walk-in pantry, office on first floor, this Best Custom Home build is meticulous. All the privacy of May River Forest and less than a mile from the heart of Wilson Village. 112 Vinson Road is a 3,810-square-foot-residence built by Resort Custom Homes with views of a freshwater lake in Moreland Village. This home displays Lowcountry charm with multiple porches and refined interior details. The kitchen features a butlerGÇÖs pantry, wine refrigerator, as well as Wolf and Sub-Zero appliances. The first floor includes a master suite while the second floor includes three guest suites and a bunk room. An outdoor kitchen, fireplace, and a retractable phantom screen wall provide seamless access to the side yard. Completing this home is a two-car garage for ample storage space, mud room and laundry room. Arguably the best location in Palmetto Bluff, 64A Boathouse Row looks across the park to the May River. This luxurious 4-bedroom, 4-bathroom townhome is one of only five built in the Wilson Village. Gracious Lowcountry details welcome you from the courtyard entrance, through the beautiful living spaces, to the quintessential southern back porch w/ stunning river views. W/ hardwood floors throughout, a well-appointed chefGÇÖs dream kitchen, & close proximity to restaurants, nature trails, & the marina, this unique property is a rare find. Eligible for short term rental through Montage, which includes room service & other five star amenities. Catch picturesque views of saltwater marshes, live oaks, and CauleyGÇÖs Creek from virtually every room in 26 Jackfield Road, a fabulous 5-bedroom home located in the Barge Landing neighborhood of Palmetto Bluff. The elevated architectural design allows for 8+ cars in the garage, while the main level features a master suite, two guest bedrooms, an inviting open floor plan for the kitchen, living, and dining spaces, and a gracious screen porch that runs the length of the home. Two additional ensuite bedrooms, including a junior master with kitchenette, are located on the second floor. Attention to detail aboundsGÇöthis home is a must-see! Inspiration abounds at 592 Mount Pelia Rd! Boasting grand park views and adjacent protected lands. A spectacular main house, detached 2.5 car garage, and a third structure GÇô an architectural gem - that currently acts as an art studio. The first floor of the main house features a home office, master suite, and an open-concept living room with accordion doors that invite you to bring the outdoors in. Two en-suite bedrooms, a library, and abundant storage are located upstairs. Details including raised garden beds, a potting shed, reclaimed wide-plank flooring, and eye-catching finishes make this property equally special inside and out. A rare find in the heart of Wilson Village, 621 Old Palmetto Bluff Rd is a recently renovated 3-bedroom/3.5-bath home. Situated on a beautiful corner lot w/ centuries old Live Oaks, the exterior boasts plenty of Lowcountry curb appeal while the interior abounds w/ coastal charm. The open floor plan features a bright kitchen w/ new appliances, abundant natural light, & two master suitesGÇöone upstairs & one down. The screened porch includes a fantastic outdoor kitchen that leads to a lovely private courtyard for indoor/outdoor entertaining. Close to all the Wilson Village amenities & eligible for short term rental through Montage Palmetto Bluff.